Dendritic cells (DCs) regulate the development of distinct Th populations and thereby provoke appropriate immune responses to various kinds of Ags. In the present work, we investigated the role CD40-CD154 interactions play during the process of Th cell priming by CD8α+ and CD8α− murine DC subsets, which have been reported to differently regulate the Th response. Adoptive transfer of Ag-pulsed CD8α+ DCs induced a Th1 response and the production of IgG2a Abs, whereas transfer of CD8α− DCs induced Th2 cells and IgE Abs in vivo. Induction of distinct Th populations by each DC subset was also confirmed in vitro. 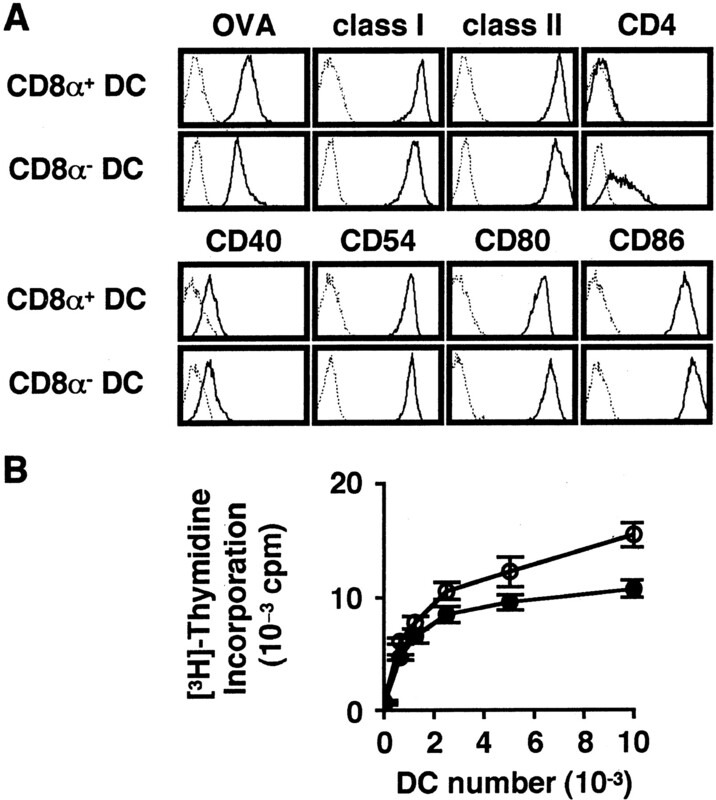 Although interruption of CD80/CD86-CD28 interactions inhibited Th cell priming by both DC subsets, disruption of CD40-CD154 interactions only inhibited the induction of the Th1 response by CD8α+ DCs in vivo. CD40-CD154 interactions were not required for the proliferation of Ag-specific naive Th cells stimulated by either DC subset, but were indispensable in the production of IL-12 from CD8α+ DCs and their induction of Th1 cells in vitro. Taken together, in our immunization model of Ag-pulsed DC transfer, CD40-CD154 interactions play an important role in the development of CD8α+ DC-driven Th1 responses but not CD8α− DC-driven Th2 responses to protein Ags. Dendritic cells (DCs)3 are specialized APCs that activate naive T lymphocytes and initiate adaptive immunity (1, 2). In response to Ag presentation by DCs, naive Th cells differentiate into one of several functional subsets that differ in their cytokine secretion patterns and effector functions. Th1 cells secrete IFN-γ and promote cellular immunity by activating CTLs, NK cells, and macrophages. In contrast, Th2 cells secrete IL-4, IL-5, IL-10, and IL-13, which induce Ig class switching to IgE and promote eosinophil-predominant inflammation. There are likely to be other Th subsets, such as Th0 and T regulatory cells, which produce various combinations of cytokines. The balance between these Th subsets determines the nature, strength, and duration of immune responses (3, 4). The current understanding is that a series of defined signals must be delivered to naive Th cells to initiate effective immune responses. Along with the presentation of antigenic peptides to TCRs, appropriate costimulation must be provided for the activation and proliferation of naive Th cells. Furthermore, a large body of evidence suggests that DCs provide additional signals that instruct the functional differentiation of Th cells. These Th cell differentiation-regulating signals involve many factors, most of which are related to DCs (5, 6). Two distinct DC subsets in the murine spleen have been characterized with regard to the expression of the CD8 α-chain (7, 8). In vitro studies suggest that CD8α+ DCs induce a limited T cell response and may play a role in the regulation of immune responses, whereas CD8α− DCs may be more stimulatory (9, 10, 11). In vivo studies have shown that injection of CD8α+ DCs triggers the development of Th1 cells whereas injection of CD8α− DCs induces a Th2-type response to soluble Ags (12, 13). It was later shown that neither CD8α+ nor CD8α− DCs can induce optimal T cell responses in their immature state and that their maturation is a prerequisite for both subsets to become potent activators of naive T cells (14). Moreover, recent studies revealed that CD8α+ DCs are responsible for maintaining peripheral tolerance under steady-state conditions (15, 16) but administration of an agonistic anti-CD40 Ab induces them to provoke a CTL response to tissue-associated Ags (16, 17). These studies clearly illustrate that the functional properties of each DC subset are not immutably fixed and that factors such as the maturation state of the DCs and the costimulatory molecules that they express contribute to the regulation of T cell priming. Of the multiple costimulatory pathways that have been identified, CD40-CD154 interaction is thought to play a pivotal role in the process of T cell priming by DCs (18, 19, 20). CD154 is a member of the TNF family and is expressed primarily on activated Th cells. CD40, the receptor for CD154, is expressed on APCs such as B cells, macrophages, and DCs. CD40 ligation induces the maturation and activation of DCs (21) and promotes their secretion of cytokines such as IL-12 (22, 23), which is essential for the development of the Th1 response (24, 25, 26, 27). In addition, exposure of DCs to a Th1-inducing pathogen up-regulates their expression of CD40 and enhances their potential to produce IL-12 in response to CD40 engagement (28, 29, 30). This reveals an attractive mechanism by which the development of a Th1 response can be augmented. Consistent with these observations, several studies revealed the importance of CD40-CD154 interactions in the development of anti-infection Th1 responses (31, 32, 33, 34). However, recent studies have revealed that the CD40-CD154 interaction is also critically involved in the development of Th2 responses (35, 36, 37, 38). Thus, the role that this costimulatory interaction plays in the induction of an appropriate immune response is complex. To date, there are several reports concerning the role of CD40-CD154 interactions in the CTL-priming function of the CD8α+ and CD8α− DC subsets (16, 17). However, little is known about how each DC subset participates in naive Th cell priming. In particular, the role they play in regulating Th cell differentiation is unclear. In this study, we report on the new experimental systems that we developed to evaluate Th cell priming by CD8α+ and CD8α− DCs and the role the CD40-CD154 interaction plays in these activities. We found that the adoptive transfer of each DC subset induces the production of a distinct Ab that reflects their potential to provoke a specific type of Th response in vivo. We also found that each DC subset could induce a specific type of Th response in vitro. The interruption of the CD40-CD154 interaction both in vivo and in vitro inhibited the induction of the Th1 response by CD8α+ DCs but had little effect on the Th2 response induced by CD8α− DCs. Our results indicate that CD40-CD154 interactions play an important role in the development of CD8α+ DC-driven Th1 responses but not in CD8α− DC-driven Th2 responses. BALB/c and C57BL/6 6- to 12-wk-old mice were purchased from Seac Yoshitomi (Fukuoka, Japan). DO11.10 mice on the BALB/c background, transgenic for a TCR recognizing a chicken OVA peptide (OVA323–339) in the context of the MHC class II molecule I-Ad, were a generous gift from Dr. S. Sakaguchi (Kyoto University, Kyoto, Japan). All mice were maintained in our pathogen-free facility and were cared for in accordance with the institutional guidelines for animal welfare. Murine rGM-CSF and rIL-2 were kindly provided by Kirin Brewery (Tokyo, Japan) and Shionogi Pharmaceutical (Osaka, Japan), respectively. Murine rIL-4 and rIL-12 were obtained from R&D Systems (Eugene, OR). OVA and keyhole limpet hemocyanin (KLH) preparations that contain minimum levels of endotoxin were purchased from Seikagaku Kogyo (Tokyo, Japan) and Calbiochem (La Jolla, CA), respectively. ChromPure human IgG (hu-IgG) and hamster IgG (ham-IgG) were obtained from Jackson ImmunoResearch Laboratories (West Grove, PA). Functional grade purified anti-CD40 (HM40-3) and anti-CD154 (MR1) mAbs were purchased from BD PharMingen (San Diego, CA) and eBioscience (San Diego, CA), respectively. Recombinant adenovirus vectors containing CD40-Ig or CTLA4-Ig gene, which encode an extracellular portion of murine CD40 or CTLA4 linked to the Fc portion of human IgG, were prepared as described (39, 40). COS7 cells were transfected with these vectors and the chimeric proteins were purified from the culture supernatant. DCs were prepared as described but with a minor modification (13). Briefly, spleens of 8- to 12-wk-old BALB/c mice were digested with collagenase D (Roche Molecular Biochemicals, Mannheim, Germany), filtered through a nylon sieve and further dissociated in Ca2+-free HBSS containing 10 mM EDTA. The cells were resuspended in HistoDenz solution (Sigma-Aldrich, St. Louis, MO) and separated into low- and high-density fractions by centrifugation at 1700 × g for 15 min. The low-density cells were collected and incubated for 90 min in X-VIVO 15 (BioWhittaker, Walkersville, MD) supplemented with 0.5% mouse plasma, 50 μM 2-ME, and 20 ng/ml rGM-CSF. Nonadherent cells were washed off and the remaining cells were cultured overnight in fresh medium containing 1 mg/ml OVA or KLH to allow the DCs to detach from the plastic dishes. Floating cells were collected and CD8α+ DCs were positively selected using anti-CD8 MicroBeads and autoMACS (Miltenyi Biotec, Bergisch Gladbach, Germany). From the negative fraction, CD8α+ DCs were further depleted and CD8α− DCs were positively enriched with anti-CD11c MicroBeads (Miltenyi Biotec). Flow cytometric analysis revealed that each purified fraction contained >96% CD8α+CD11c+ and CD8α−CD11c+ cells (data not shown). CD4+ cells were positively selected from spleen cells of DO11.10 transgenic mice using Dynabeads mouse CD4 and DETACHaBEAD mouse CD4 (Dynal Biotech, Oslo, Norway) according to the manufacturer’s instructions. From the enriched CD4+ cells, naive cells were positively selected using anti-CD62 ligand MicroBeads and autoMACS (Miltenyi Biotec). For the cytokine production experiment, 2 × 105 KLH-pulsed DCs were transferred i.v. into 6- to 7-wk-old BALB/c mice on day 0. Spleens were removed for the cytokine production assay on day 14. For the Ab-production experiment, OVA-pulsed DCs were administered and a boost of 100 μg of soluble OVA was given i.v. on day 14. Mice were bled 7 days later to measure serum Ab titers. To interrupt the CD40-CD154 or CD28-CD80/CD86 interactions, 200 μg of CD40-Ig or CTLA4-Ig was administered i.v. on days 0, 2, and 4 after DC transfer. Control mice received an equivalent amount of hu-IgG. Fourteen days after the transfer of KLH-pulsed DCs, spleens were removed and single-cell suspensions were prepared. A total of 3 × 107 cells from each mouse were pooled within each experimental group and CD4+ cells were positively selected using anti-CD4 MicroBeads and autoMACS (Miltenyi Biotec). Purified CD4+ cells (106 cells/well) and 30 Gy-irradiated BALB/c splenocytes (106 cells/well) were cocultured in 48-well plates in X-VIVO 20 (BioWhittaker) supplemented with 0.5% mouse plasma and 50 μM 2-ME with or without KLH (100 μg/ml). Supernatants were harvested 72 h later and stored at −40°C for subsequent cytokine analysis using ELISA. OVA-pulsed DCs (2.5 × 103 cells/well) and naive DO11.10 T cells (5 × 104 cells/well) were suspended in X-VIVO 15 supplemented with 0.5% mouse plasma, 50 μM 2-ME, and 20 ng/ml rGM-CSF and then cocultured for 72 h in 96-well U-bottom plates (BD Falcon, Franklin Lakes, NJ). CTLA4-Ig, CD40-Ig, anti-CD154 Ab (MR1), hu-IgG, or ham-IgG was added at graded concentrations. 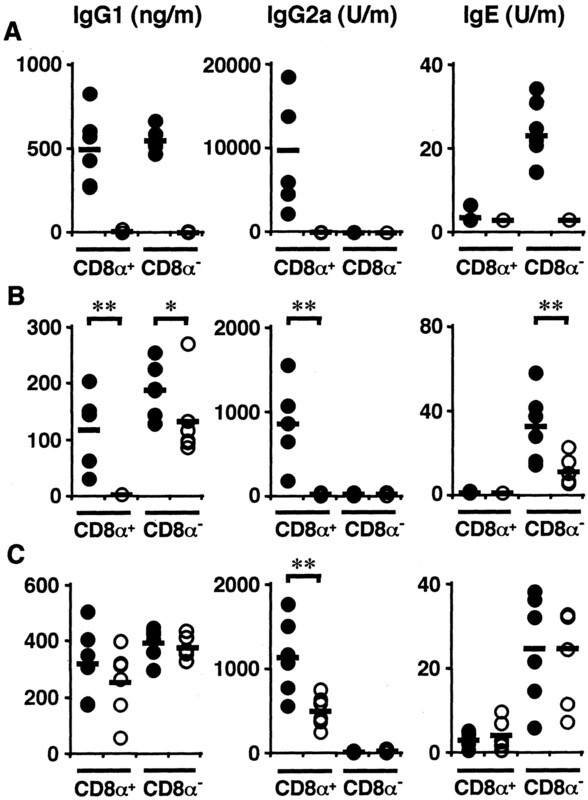 For the allogeneic MLR, splenic CD4+ cells (1 × 105 cells/well) from C57BL/6 mice were stimulated with graded numbers of BALB/c DCs. [methyl-3H]Thymidine (0.5 μCi/well; Moravek Biochemicals, Brea, CA) was pulsed for the last 8 h, and cell proliferation was determined by measuring radioactivity incorporated into the DNA using MeltiLex solid scintillation counting on a MicroBeta TRILUX beta-emitter detection system (PerkinElmer Wallac, Boston, MA). OVA-pulsed DCs (1 × 104 cells/well) and naive DO11.10 T cells (2 × 105 cells/well) were cocultured in 96-well U-bottom plates as for the T cell proliferation assay. 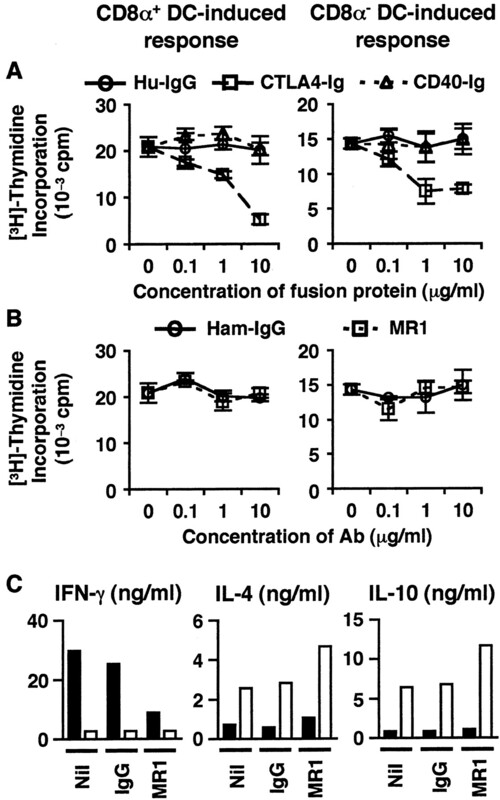 Anti-CD154 Ab (MR1) or ham-IgG at 10 μg/ml was added. On days 3, 4, and 6, the cultures were split and expanded in the presence of rIL-2 (35 U/ml). Cells were harvested on day 9, washed extensively, counted, and viable cells were tested for cytokine production. T cells (2 × 105 cells/well) were restimulated in a 96-well U-bottom plate with 30 Gy-irradiated BALB/c splenocytes (2 × 105 cells/well) and OVA (100 μg/ml). After 48 h of this restimulation, supernatants were collected and stored at −40°C for subsequent analysis. Anti-CD154 Ab (MR1) was used instead of CD40-Ig because the addition of hu-IgG altered the cytokine production profile and could not be used as a control (data not shown). To determine the expression of surface molecules, sorted DCs were labeled with the following mAbs: PE-conjugated anti-CD4 (GK1.5; BD PharMingen), anti-CD40 (3/23; Caltag Laboratories, Burlingame, CA), anti-CD54 (3E2; BD PharMingen), anti-CD80 (16-10A1; BD PharMingen), anti-CD86 (GL1; BD PharMingen), anti-MHC class I (SF1-1.1; BD PharMingen), FITC-conjugated anti-MHC class II (M5/114.15.2; eBioscience), and isotype-matched controls (BD PharMingen). The Ag-uptake potential of DC subsets was evaluated by pulsing DCs with FITC-conjugated OVA (Molecular Probes, Minneapolis, MN). To analyze the expression kinetics of costimulatory molecules after DC-T interaction, cultured cells were dissociated in Ca2+-free HBSS containing 10 mM EDTA and labeled with PE-conjugated anti-CD28 (37.51; eBioscience), anti-CD40, anti-CD80, anti-CD86, anti-CD152 (UC10-4B9; eBioscience) or anti-CD154 (MR1; eBioscience) mAbs. Allophycocyanin-conjugated anti-CD4 mAb or biotin-conjugated anti-CD11c (HL3; BD PharMingen) mAb, followed by allophycocyanin-streptavidin (BD PharMingen), was used to distinguish DCs from T cells. Anti-mouse CD16/CD32 mAb (2.4G2; BD PharMingen) was used to block nonspecific binding to the Fc receptor before staining. Samples were analyzed using a FACSCaliber flow cytometer and CellQuest software (BD Biosciences, Franklin Lakes, NJ). Sorted DC subsets were suspended in X-VIVO 15 supplemented with 0.5% mouse plasma, 50 μM 2-ME, 20 ng/ml rGM-CSF, and 10 ng/ml rIL-4 and then stimulated in 96-well U-bottom plates (2 × 105 cells/well) with 20 μg/ml anti-CD40 mAb (HM40-3) or 100 ng/ml LPS (Sigma-Aldrich). Supernatants were collected 24 h later and stored at −40°C for subsequent analysis. Serum levels of OVA-specific Abs were determined as previously described but with minor modifications (41). To measure OVA-specific IgE, serum IgE was absorbed to 96-well EIA/RIA plates (Corning, Corning, NY) coated with 2 μg/ml anti-mouse IgE mAb (R35-72; BD PharMingen) and the bound Abs were detected by biotinylated OVA, followed by streptavidin-HRP conjugate (BD PharMingen). To detect OVA-specific IgG1 and IgG2a, sera were incubated in 96-well plates coated with OVA (50 μg/ml) and bound Abs were detected using biotin-conjugated anti-mouse IgG1 (A85-1; BD PharMingen) and IgG2a (R19-15; BD PharMingen) mAbs, followed by streptavidin-HRP conjugate. The Ab titers were calculated by comparison with internal standards run in each assay. Anti-OVA IgE and IgG2a serum standards were obtained by pooling sera from mice immunized i.p. with OVA and Imject Alum (Pierce, Rockford, IL). Anti-OVA IgG1 mAb (OVA-14; Sigma-Aldrich) was used as a standard. Quantitative ELISAs for IFN-γ, IL-4, and IL-10 in culture supernatants were conducted using OptEIA mouse cytokine sets (BD PharMingen). IL-12p70 in culture supernatants was quantified using the DuoSet ELISA Development kit (R&D Systems). Differences between two groups were examined for statistical significance by using the Student’s t test for cytokine concentration and Mann-Whitney U test for Ab titers. A value of p < 0.05 level was considered to be significant. We first assessed the role that the CD40-CD154 interaction plays during DC-induced splenic Th cell polarization in vivo. KLH-pulsed CD8α+ and CD8α− DCs were transferred into naive mice and 14 days later their splenic CD4+ cells were cultured in the presence of KLH. The culture supernatants were then assessed for cytokine production. The KLH-pulsed CD8α+ DCs induced a much higher level of IFN-γ production, whereas CD8α− DCs preferentially induced the production of IL-4 and IL-10 (Fig. 1⇓A). To interrupt the CD40-CD154 or CD28-CD80/CD86 costimulatory interactions, CD40-Ig or CTLA4-Ig was injected three times at 2-day intervals starting on the day of the DC transfer. Administration of CTLA4-Ig inhibited the IFN-γ and IL-4/IL-10 production by the splenic CD4+ cells of the mice that had received the CD8α+ and CD8α− DCs, respectively (Fig. 1⇓B). Administration of CD40-Ig also inhibited the IFN-γ production of the splenic CD4+ cells induced by CD8α+ DC-transfer (Fig. 1⇓C). In contrast, the IL-4 and IL-10 production by CD8α− DC-transferred mice remained unchanged (Fig. 1⇓C). 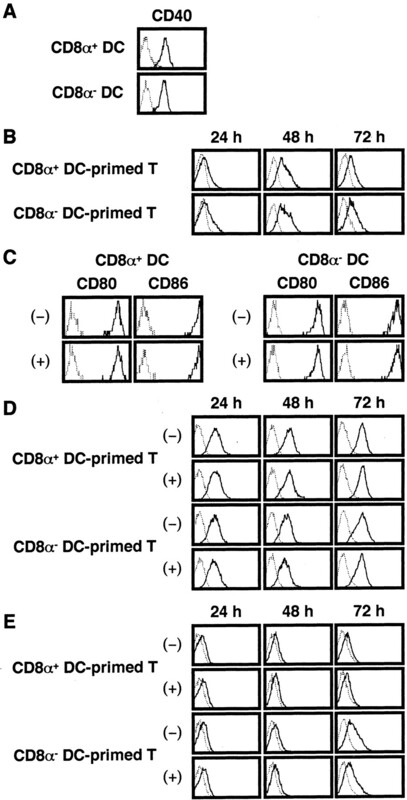 These results indicate that while CD80/CD86-CD28 interactions are required for the Th cell priming by both CD8α+ and CD8α− DCs, CD40-CD154 interactions are only required for the induction of the Th1 response by CD8α+ DCs in vivo. Effect of CTLA4-Ig and CD40-Ig on CD8α+ DC-induced and CD8α− DC-induced Th responses. A, Groups of BALB/c mice (n = 3) were injected with KLH-pulsed CD8α+ DCs (▪), CD8α− DCs (▨), or PBS (□). Fourteen days later, CD4+ cells were positively selected from the pooled splenocytes of each experimental group and stimulated with irradiated BALB/c splenocytes and KLH. Culture supernatants were harvested 72 h later and assayed for cytokine concentrations by ELISA. B and C, Groups of mice (n = 3) were immunized with KLH-pulsed CD8α+ DCs or CD8α− DCs and injected with CTLA4-Ig (B) or CD40-Ig (C) (▨) three times at 2-day intervals. Control mice received hu-IgG (▪). The cytokine production of the splenic CD4+ cells was determined as in A. The data shown are the mean ± SD of triplicate wells and are representative of three independent experiments with similar results. ∗, p < 0.05 by Student’s t test. It has been reported that the in vivo transfer of Ag-pulsed DCs efficiently induces an Ag-specific Ab response (42). We modified this system and evaluated the effect of costimulation blockade on the Ab production profile induced by CD8α+ and CD8α− DCs. OVA-pulsed DCs were adoptively transferred into syngeneic BALB/c mice and a boost of soluble OVA was given i.v. 14 days later. The mice were bled 7 days later and the OVA-specific Abs in the sera were measured by ELISA. As shown in Fig. 2⇓A, OVA-specific IgG2a was detected specifically in the mice that had received the CD8α+ DCs whereas OVA-specific IgE was detected in mice given CD8α− DCs. Similar levels of OVA-specific IgG1 were induced by either DC subset. When the dose of OVA that was used to Ag-pulse the DC was titrated from 30 μg/ml to 1 mg/ml, dose-dependent alterations in the levels of Ab production but no changes in the isotype profile were observed (data not shown). The Ab response was Ag-specific because injection of KLH-pulsed DCs, followed by a boost of soluble OVA, failed to induce the production of OVA-specific Abs (data not shown). In addition, OVA-specific Abs were not detected when mice were given an injection of OVA-pulsed DCs but no boost of soluble OVA (Fig. 2⇓A). Because IFN-γ induces Ig-class switching to IgG2a, whereas IL-4 enhances the production of IgE, our results indicate that each DC subset induces a distinct Ab response that reflects their potential to prime a distinct type of Th response. Effect of CTLA4-Ig and CD40-Ig on CD8α+ DC-induced and CD8α− DC-induced Ab responses. A, Groups of mice (n = 6–7 per group) received OVA-pulsed CD8α+ or CD8α− DCs and a boost of soluble OVA (•) or PBS (○) 14 days later. Sera were collected 7 days later and assayed for OVA-specific Ab isotype titers by ELISA. B and C, Groups of mice (n = 5–6 per group) received OVA-pulsed CD8α+ or CD8α− DCs and were injected with CTLA4-Ig (B) or CD40-Ig (C) (○) three times at 2-day intervals. Control mice received hu-IgG (•). A boost of soluble OVA was given 14 days after the DC transfer and serum levels of OVA-specific Ab isotype titers were assayed as in A. Each circle represents the titer of a single mouse, and bars show mean values for each group. ∗, p < 0.05; ∗∗, p < 0.01 by Mann-Whitney U test. Consistent with the cytokine production inhibition patterns, all Ab classes induced by either DC subset were inhibited by CTLA4-Ig (Fig. 2⇑B) but CD40-Ig only inhibited the production of IgG2a induced by the CD8α+ DCs (Fig. 2⇑C). CD40-Ig did not affect the levels of IgG1 induced by the CD8α+ DCs or the IgG1 and IgE Abs induced by CD8α− DCs (Fig. 2⇑C). These results further support the view that CD40-CD154 interactions are only required for the induction of the Th1 response by CD8α+ DCs in vivo. Naive Th cells must receive a defined series of activation and differentiation signals before they can mount appropriate immune responses. Thus, Th cell priming could be inhibited at two distinct levels, namely, at their activation or at their differentiation. The inhibition of their activation is likely to reduce the proliferation of Th cells but inhibition of their differentiation may not interfere with their proliferation. To elucidate the roles the CD40-CD154 interaction plays in the DC-primed proliferation and differentiation of Th cells, we used DO11.10 T cells in an in vitro assay system. Thus, naive Th cells from DO11.10 mice were stimulated with OVA-pulsed DCs and their proliferative response was determined using the thymidine incorporation assay. As expected, T cells proliferated abundantly in response to both DC subtypes (Fig. 3⇓, A and B). This response was Ag-specific because DCs not pulsed with OVA failed to induce any significant proliferation of DO11.10 T cells (data not shown). Although CTLA4-Ig dose-dependently inhibited the proliferation of Th cells induced by both the CD8α+ (Fig. 3⇓A, left) and CD8α− DCs (Fig. 3⇓A, right), CD40-Ig did not suppress the proliferation induced by either subset (Fig. 3⇓A). The anti-CD154 mAb MR1, another agent commonly used to block the CD40-CD154 interaction, also failed to inhibit the proliferative response (Fig. 3⇓B). The CD40-CD154 interaction is not required for the proliferation of naive Th cells, but is indispensable for the induction of Th1 cells by CD8α+ DCs in vitro. A and B, Naive DO11.10 CD4+ T cells were cultured for 72 h with OVA-pulsed CD8α+ (left) or CD8α− (right) DCs. CTLA4-Ig, CD40-Ig (A) or anti-CD154 Ab (MR1) (B) was added to the cultures at graded concentrations. Proliferation was measured by pulsing the cultures with [3H]thymidine for the last 8 h. C, Naive DO11.10 splenic CD4+ T cells were primed with OVA-pulsed CD8α+ (▪) or CD8α− (□) DCs in the presence or absence of the anti-CD154 Ab (MR1) or ham-IgG. The primed T cells were restimulated with irradiated splenocytes and OVA. Culture supernatants were harvested 48 h later and assayed for cytokine concentrations using ELISA. The data shown are representative of four (A and B) or six (C) independent experiments, all with similar results. We then investigated whether interfering with the CD40-CD154 interaction would reduce the Th differentiation induced by the DC subsets. Thus, we determined the cytokine production profile of DO11.10 CD4+ T cells primed by OVA-pulsed DCs in the presence or absence of the anti-CD154 mAb MR1. When restimulated with OVA and irradiated BALB/c splenocytes as APCs, CD8α+ DC-primed T cells primarily produced IFN-γ whereas IL-4 and IL-10 were preferentially produced by CD8α− DC-primed T cells (Fig. 3⇑C). However, when the MR1 Ab was present during the priming, the production of IFN-γ by CD8α+ DC-primed T cells was reduced (Fig. 3⇑C). In contrast, the IL-4 and IL-10 production by CD8α− DC-primed T cells was not affected by MR1 (Fig. 3⇑C). Taken together, it appears that although the CD80/CD86-CD28 interaction is required for the DC-induced activation and proliferation of naive T cells, the CD40-CD154 interaction is only required for the CD8α+ DC-induced differentiation of Th1 cells. We next analyzed the Ag-uptake potential and the surface expression of costimulatory molecules on CD8α+ and CD8α− DCs. Consistent with previous reports (43, 44), both DC subsets showed extensive uptake of OVA and expressed similar levels of CD40 as well as CD54, CD80, CD86, MHC class I and class II molecules after their initial isolation (Fig. 4⇓A). About one-half of the CD8α− DCs expressed CD4, whereas the CD8α+ DCs did not (Fig. 4⇓A). In addition, both DC subsets induced a vigorous allogeneic MLR (Fig. 4⇓B), although CD8α− DCs induced slightly higher response (9). CD8α+ and CD8α− DCs express similar levels of costimulatory molecules. A, CD8α+ and CD8α− DCs were pulsed with FITC-OVA and analyzed for Ag-uptake potential. Their surface expression of CD4, CD40, CD54, CD80, CD86, MHC class I and class II molecules was also evaluated. The dotted lines represent DCs pulsed with unlabeled OVA or stained with isotype controls. B, Graded numbers of CD8α+ (•) and CD8α− DCs (○) were cultured with C57BL6 splenic CD4+ cells for 72 h. Proliferation was measured by pulsing the cultures with [3H]thymidine for the last 8 h. The data shown are representative of at least three independent experiments, all with similar results. There remains a possibility that the differential requirement of CD40-CD154 interaction by the two DC subsets merely reflects the difference in the surface expression of these molecules after DC-T cell interaction, or that it may be due to an alteration in the expression of other costimulatory molecules, such as CD28-CD80/CD86. We tested this and found that after interacting with Th cells, the expression of CD40 on each DC subset was equally elevated (Fig. 5⇓A). Moreover, similar levels of CD154 expression were induced on Th cells by either DC subset (Fig. 5⇓B). The expression of CD80 and CD86 on DCs, as well as that of CD28 and CD152 on Th cells, was also not altered by interfering with the CD40-CD154 interaction during Th cell priming by the DCs (Fig. 5⇓, C–E). CD8α+ and CD8α− DCs express similar levels of CD40 after interaction with Th cells and induce similar levels of CD154 expression. A, OVA-pulsed CD8α+ and CD8α− DCs were cultured with naive DO11.10 CD4+ T cells and surface expression of CD40 was analyzed 24 h later. B, Naive DO11.10 T cells were primed with OVA-pulsed CD8α+ or CD8α− DCs and surface expression of CD154 was analyzed at the indicated time points. C, OVA-pulsed DCs were cultured with naive DO11.10 T cells with (+) or without (−) anti-CD154 blocking mAb (MR1) and surface expression of CD80 and CD86 was analyzed 24 h later. D and E, Naive DO11.10 T cells were primed with OVA-pulsed DCs as in C and surface expression of CD28 (D) and CD152 (E) was analyzed at the indicated time points. The data shown are representative of at least three independent experiments, all with similar results. It has been suggested that DC-derived IL-12 plays a crucial role in determining the Th1/Th2-promoting capacity of the CD8α+ and CD8α− DCs, and that IFN-γ promotes a Th1 response by inducing IL-12 production from CD8α+ DCs whereas IL-10 promotes a Th2 response by inhibiting the IL-12 production by CD8α− DCs (45). Consequently, we analyzed the cytokine production of CD8α+ and CD8α− DCs when they were cultured in the presence of an agonistic anti-CD40 mAb. CD8α+ DCs produced IL-12 and IFN-γ after this CD40 triggering (Fig. 6⇓). However, the CD8α+ DCs also produced substantial amounts of IL-10 regardless of CD40 signaling (Fig. 6⇓). In contrast, CD8α− DCs did not produce either of these cytokines in response to CD40 triggering, and this is not because they produce IL-10 that suppresses their IL-12 production. Notably, neither DC subset produced IL-12 in response to LPS stimulation (Fig. 6⇓). These results show that the two DC subtypes differ fundamentally in the cytokines they produce once their CD40 molecules have been ligated, and suggest that the distinct Th differentiation associated with each DC subtype is due to a basic difference in their response to CD40 ligation. Selective production of cytokines by CD8α+ DCs after CD40 triggering. Sorted DC subsets were left untreated (□) or stimulated either with an agonistic anti-CD40 mAb (▪) or LPS (▧). The culture supernatants were harvested 24 h later and assayed for cytokine concentrations by ELISA. The data shown are representative of three independent experiments, all with similar results. Murine DCs isolated from the spleen fall into two distinct subsets with respect to their expression of the CD8 α-chain and the type of Th response they induce. Two in vivo studies have revealed that injection of CD8α+ DCs triggers the development of Th1 cells, whereas injection of CD8α− DCs induces a Th2-type response to soluble Ags (12, 13). With regard to the induction of humoral immunity, it was found that the selective expansion of either DC subset in vivo by the administration of growth factors results in increased Ab titers with skewed isotype profiles (12). However, the types of Ab responses that are induced by each DC subset remained to be determined. As Th1 and Th2 cells induce the production of distinct Ab isotypes (46), and the transfer of Ag-pulsed DCs efficiently induces an Ag-specific Ab response after a boost of soluble Ag in vivo (42), we speculated that the transfer of each DC subset would lead to the production of a distinct class of Abs that would reflect their potential to provoke a specific type of Th response. As shown in Fig. 2⇑A, CD8α+ and CD8α− DCs specifically induced Ag-specific IgG2a and IgE production, respectively. This was in accord with the cytokine production profile of the splenic CD4+ T cells obtained from mice transferred with each DC subset because CD8α+ DCs induced much higher levels of IFN-γ, whereas IL-4 and IL-10 production was preferentially induced by CD8α− DCs (Fig. 1⇑A). Of note, similar levels of Ag-specific IgG1 Abs, which are often viewed as being associated with the Th2 response, were induced by both DC subsets (Fig. 2⇑A). In this respect, one report has indicated that IgG1 production is not entirely Th2-dependent (47), and another has revealed that both Th1 and Th2 cells induce similar levels of IgG1 production (46). We also showed that each DC subset could induce a distinct type of Th response in vitro (Fig. 3⇑C). Notably, the distinct effect of these subsets on Th cell differentiation, in particular the induction of Th2 cells by CD8α− DCs, was confirmed only when U-bottom but not flat-bottom plates were used for the priming (data not shown). This suggests that close cell-to-cell contact between DCs and Th cells, or among the Th cells themselves is important for the effective differentiation of Th cells. As the culture system was comprised of DCs and Th cells, these in vitro observations also reveal that DCs actually provide a distinct signal that leads to the differentiation of Th cells. Taken together, our results indicate that CD8α+ and CD8α− DCs induce a distinct type of Th response both in vivo and in vitro that account for the different effects of these subsets on the production of specific Ab isotypes in vivo. It is now well established that CD40-CD154 interactions play an important role in the priming of CD4+ Th cell by DCs (18, 19, 20). In the present study, we found that the CD40-CD154 interaction is preferentially required for the induction of a Th1 response by CD8α+ DCs but not for the induction of a Th2 response by CD8α− DCs in vivo (Fig. 1⇑C). These effects of CD40-Ig administration in vivo on the cytokine production profile were reflected in a selective reduction in the IgG2a Ab class that is produced by the transfer of CD8α+ DCs (Fig. 2⇑C). 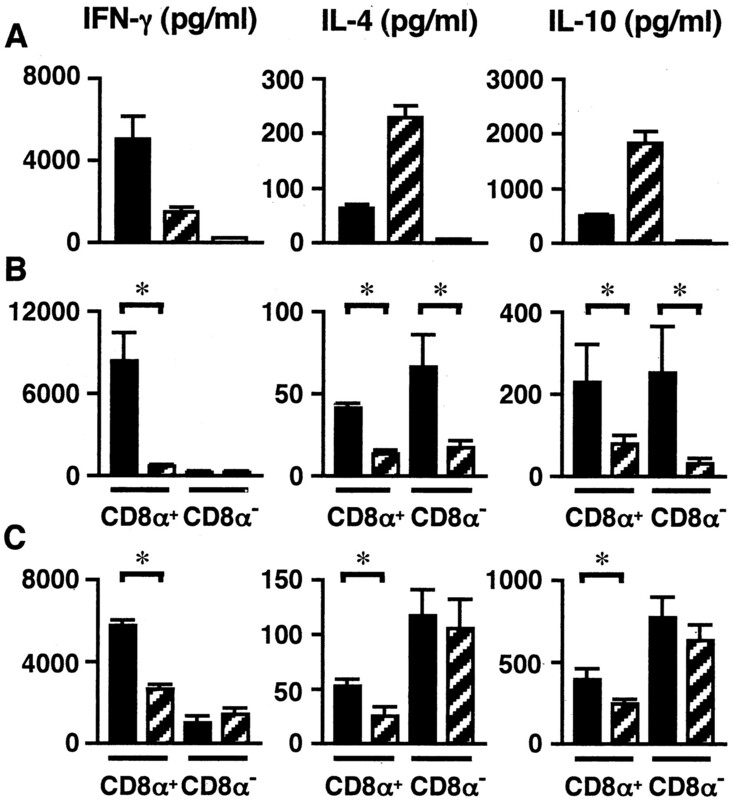 CD40-Ig had no effect on the Ab profile generated by CD8α− DCs (Fig. 2⇑C). In accordance with these in vivo results, CD40-CD154 blockade inhibited the Th1 differentiation of Ag-specific naive Th cells stimulated by CD8α+ DCs in vitro (Fig. 3⇑C). We also noted that the DC-induced proliferation of naive Th cells was not inhibited by interrupting the CD40-CD154 interaction (Fig. 3⇑, A and B). Thus, it appears that the CD40-CD154 costimulatory pathway is required for the CD8α+ DC-induced differentiation of Th1 cells but not for the activation of naive Th cells or the CD8α− DC-induced differentiation of Th2 cells. There was a possibility that the different requirement of CD40-CD154 interaction by the two DC subsets merely reflects the difference in the surface expression of these molecules. However, we found that CD8α+ and CD8α− DCs expressed similar levels of CD40 before (Fig. 4⇑A) and 24 h after (Fig. 5⇑A) their interaction with Th cells. Analysis at later time points in the in vitro culture was not performed because only a few cells were positive for CD11c by that stage. In addition, both the CD8α+ and CD8α− DC subsets induced similar levels of CD154 expression on naive Th cells (Fig. 5⇑B) and the addition of exogenous IL-12 to the culture did not have a significant effect on their CD154 expression (data not shown). Notably, some studies have reported that activated Th cells under Th1-inducing conditions preferentially express CD154 (48, 49). However, these studies used different methods to stimulate the Th cells and it is thus difficult to determine why their observations differ from our own. We also found that expression of CD80/CD86 on DCs, as well as CD28/CD152 on Th cells, was not altered by blocking CD40-CD154 interaction during Th cell priming by the two DC subsets (Fig. 5⇑, C–E). The importance of CD40-CD154 interactions in Th cell priming was first revealed by studies on CD154 knockout mice, which are characterized by defective Th cell responses to protein Ags (50). The CD154-deficient Th cells do not undergo clonal expansion and enter the cell cycle, which suggests a probable defect at an early stage of T cell activation. Because constitutive CD80/CD86-CD28 costimulation appears to restore the potential of CD154-deficient mice to prime Th cells in some systems (51, 52), and DCs up-regulate CD80/CD86 molecules upon CD40 ligation (21), lack of CD40-dependent DC activation is likely to be responsible for the defects in Th cell priming seen in CD154-deficient mice. As CD8α+ and CD8α− DCs already express high levels of CD80 and CD86 (Fig. 4⇑A), these molecules may provide sufficient costimulation that allows the activation of naive Th cells and compensates for the lack of CD40-CD154 signaling in our experimental system. In support of this speculation, we found that blockade of CD80/CD86-CD28 interaction by CTLA4-Ig inhibited both the in vitro proliferation (Fig. 3⇑A) and the in vivo priming (Fig. 1⇑B) of Ag-specific Th cells that is induced by each DC subset, whereas the blockade of the CD40-CD154 interaction inhibited only the CD8α+ DC-induced differentiation of Th1 cells. The current view of the function of CD40 in Th cell priming is that its ligation on DCs by CD154 on Ag-primed Th cells induces the maturation and activation of the DCs and promotes the secretion of proinflammatory cytokines such as IL-12 (22, 23), which is essential for the development of the Th1 response (24, 25, 26, 27). With regard to the requirement for CD40-CD154 interactions for the development of appropriate immune responses, it is important to note that the T cell priming function of DCs is greatly influenced by the activation status of DCs themselves after exposure to the Ag (14, 53). For example, human DCs infected with Leishmania major up-regulate their surface expression of costimulatory molecules, yet their IL-12 production is still dependent on CD40-CD154 interactions (29). In contrast, CD40-deficient murine myeloid DCs efficiently produce IL-12 upon exposure to Propionibacterium acnes (37). Similarly, although CD40 triggering is necessary for APCs to produce IL-12 in response to soluble protein Ags, LPS induces its production independently of CD40-CD154 interactions (54). It was recently shown that distinct DC subsets express different combinations of pattern-recognition receptors, such as Toll-like receptors (55, 56), that identify conserved molecular patterns shared by groups of microorganisms. Because signaling through pattern-recognition receptors can in itself lead to full activation of APCs, certain pathogens directly induce the maturation of and IL-12 production by specific DC subsets (57, 58), whereas others need additional factors to activate DCs. In the present study, we used DCs that had been cultured overnight and pulsed with soluble protein Ags. It has been reported that the CD8α+ and CD8α− DC subsets up-regulate their surface expression of MHC and costimulatory molecules and acquire T cell priming capacity through this procedure (14). As CD40 signaling is still required in this system for CD8α+ DCs to produce IL-12 and IFN-γ (Fig. 6⇑), the blockade of CD40-CD154 interactions results in the inhibition of the CD8α+ DC-driven Th1 response. With respect to the unresponsiveness of CD8α+ DCs to LPS stimulation (Fig. 6⇑), it has been reported that DCs produce IL-12 only transiently after maturation and become refractory to LPS stimulation at later time points (59). In contrast to CD8α+ DCs, CD8α− DCs do not produce IL-12 regardless of CD40 triggering (Fig. 6⇑), which means that Th2 priming is unaltered by the disruption of CD40-CD154 interactions. Notably, CD8α− DCs do not even produce IL-10 in response to CD40 ligation (Fig. 6⇑), which is reported to suppress IL-12 production by DCs (45). Our results demonstrate that, after optimal maturation, CD8α− DCs can induce the Th2 response independently of CD40-CD154 interactions and that it is likely that this differential responsiveness of CD8α+ and CD8α− DCs to CD40 ligation underlies the distinct regulation of Th responses by each DC subset. Further studies focusing on signals downstream of the CD40 triggering in these DC subsets are warranted. In summary, DCs are versatile APCs capable of discriminating potentially hazardous Ags from self or nontoxic environmental ones, and can mount an appropriate immune response depending on the nature of the Ag. Although our knowledge of DCs and their roles in the priming of Th cells has expanded, there are still many questions concerning the regulation of their functions. New insights into the complex mechanisms that govern the initiation of immunity by DCs will support the development of novel strategies for the treatment of autoimmune and allergic disorders, which are likely to be caused by the inappropriate regulation of DC functions. 1 This work was supported by Grant-in-Aid for Creative Scientific Research 13GS0009 and by the Ministry of Education, Science, Technology, Sports and Culture of Japan Grant 12215067, as well as by the Program for Research on Pharmaceutical and Medical Safety and the Program for the Promotion of Fundamental Studies in Health Science of the Organization for Pharmaceutical Safety and Research in Japan. 3 Abbreviations used in this paper: DC, dendritic cell; KLH, keyhole limpet hemocyanin; hu-IgG, human IgG; ham-IgG, hamster IgG. Guermonprez, P., J. Valladeau, L. Zitvogel, C. Thery, S. Amigorena. 2002. Antigen presentation and T cell stimulation by dendritic cells. Annu. Rev. Immunol. 20:621. Abbas, A. K., K. M. Murphy, A. Sher. 1996. Functional diversity of helper T lymphocytes. Nature 383:787. O’Garra, A.. 1998. Cytokines induce the development of functionally heterogeneous T helper cell subsets. Immunity 8:275. Kalinski, P., C. M. Hilkens, E. A. Wierenga, M. L. Kapsenberg. 1999. T-cell priming by type-1 and type-2 polarized dendritic cells: the concept of a third signal. Immunol. Today 20:561. Moser, M., K. M. Murphy. 2000. Dendritic cell regulation of TH1-TH2 development. Nat. Immun. 1:199. Vremec, D., K. Shortman. 1997. Dendritic cell subtypes in mouse lymphoid organs: cross-correlation of surface markers, changes with incubation, and differences among thymus, spleen, and lymph nodes. J. Immunol. 159:565. Henri, S., D. Vremec, A. Kamath, J. Waithman, S. Williams, C. Benoist, K. Burnham, S. Saeland, E. Handman, K. Shortman. 2001. The dendritic cell populations of mouse lymph nodes. J. Immunol. 167:741. Suss, G., K. Shortman. 1996. A subclass of dendritic cells kills CD4 T cells via Fas/Fas-ligand-induced apoptosis. J. Exp. Med. 183:1789. Kronin, V., K. D. Winkel, G. Suss, A. Kelso, W. Heath, J. Kirberg, H. von Boehmer, K. Shortman. 1996. A subclass of dendritic cells regulates the response of naive CD8 T cells by limiting their IL-2 production. J. Immunol. 157:3819. Winkel, K. D., V. Kronin, M. F. Krummel, K. Shortman. 1997. The nature of the signals regulating CD8 T cell proliferative responses to CD8α+ or CD8α− dendritic cells. Eur. J. Immunol. 27:3350. Pulendran, B., J. L. Smith, G. Caspary, K. Brasel, D. Pettit, E. Maraskovsky, C. R. Maliszewski. 1999. Distinct dendritic cell subsets differentially regulate the class of immune response in vivo. Proc. Natl. Acad. Sci. USA 96:1036. Maldonado-Lopez, R., T. De Smedt, P. Michel, J. Godfroid, B. Pajak, C. Heirman, K. Thielemans, O. Leo, J. Urbain, M. Moser. 1999. CD8α+ and CD8α− subclasses of dendritic cells direct the development of distinct T helper cells in vivo. J. Exp. Med. 189:587. De Smedt, T., E. Butz, J. Smith, R. Maldonado-Lopez, B. Pajak, M. Moser, C. Maliszewski. 2001. CD8α− and CD8α+ subclasses of dendritic cells undergo phenotypic and functional maturation in vitro and in vivo. J. Leukocyte Biol. 69:951. Belz, G. T., G. M. Behrens, C. M. Smith, J. F. Miller, C. Jones, K. Lejon, C. G. Fathman, S. N. Mueller, K. Shortman, F. R. Carbone, W. R. Heath. 2002. The CD8α+ dendritic cell is responsible for inducing peripheral self-tolerance to tissue-associated antigens. J. Exp. Med. 196:1099. Liu, K., T. Iyoda, M. Saternus, Y. Kimura, K. Inaba, R. M. Steinman. 2002. Immune tolerance after delivery of dying cells to dendritic cells in situ. J. Exp. Med. 196:1091. Grohmann, U., F. Fallarino, S. Silla, R. Bianchi, M. L. Belladonna, C. Vacca, A. Micheletti, M. C. Fioretti, P. Puccetti. 2001. CD40 ligation ablates the tolerogenic potential of lymphoid dendritic cells. J. Immunol. 166:277. Grewal, I. S., R. A. Flavell. 1998. CD40 and CD154 in cell-mediated immunity. Annu. Rev. Immunol. 16:111. Mackey, M. F., R. J. Barth, Jr, R. J. Noelle. 1998. The role of CD40/CD154 interactions in the priming, differentiation, and effector function of helper and cytotoxic T cells. J. Leukocyte Biol. 63:418.
van Kooten, C., J. Banchereau. 2000. CD40-CD40 ligand. J. Leukocyte Biol. 67:2. Caux, C., C. Massacrier, B. Vanbervliet, B. Dubois, C. Van Kooten, I. Durand, J. Banchereau. 1994. Activation of human dendritic cells through CD40 cross-linking. J. Exp. Med. 180:1263. Cella, M., D. Scheidegger, K. Palmer-Lehmann, P. Lane, A. Lanzavecchia, G. Alber. 1996. Ligation of CD40 on dendritic cells triggers production of high levels of interleukin-12 and enhances T cell stimulatory capacity: T-T help via APC activation. J. Exp. Med. 184:747. Koch, F., U. Stanzl, P. Jennewein, K. Janke, C. Heufler, E. Kampgen, N. Romani, G. Schuler. 1996. High level IL-12 production by murine dendritic cells: upregulation via MHC class II and CD40 molecules and downregulation by IL-4 and IL-10. J. Exp. Med. 184:741. Hsieh, C. S., S. E. Macatonia, C. S. Tripp, S. F. Wolf, A. O’Garra, K. M. Murphy. 1993. Development of TH1 CD4+ T cells through IL-12 produced by Listeria-induced macrophages. Science 260:547. Manetti, R., P. Parronchi, M. G. Giudizi, M. P. Piccinni, E. Maggi, G. Trinchieri, S. Romagnani. 1993. Natural killer cell stimulatory factor (interleukin 12 [IL-12]) induces T helper type 1 (Th1)-specific immune responses and inhibits the development of IL-4-producing Th cells. J. Exp. Med. 177:1199. Trinchieri, G.. 1994. Interleukin-12: a cytokine produced by antigen-presenting cells with immunoregulatory functions in the generation of T-helper cells type 1 and cytotoxic lymphocytes. Blood 84:4008. Macatonia, S. E., N. A. Hosken, M. Litton, P. Vieira, C. S. Hsieh, J. A. Culpepper, M. Wysocka, G. Trinchieri, K. M. Murphy, A. O’Garra. 1995. Dendritic cells produce IL-12 and direct the development of Th1 cells from naive CD4+ T cells. J. Immunol. 154:5071. Schulz, O., A. D. Edwards, M. Schito, J. Aliberti, S. Manickasingham, A. Sher, C. Reis e Sousa. 2000. CD40 triggering of heterodimeric IL-12 p70 production by dendritic cells in vivo requires a microbial priming signal. Immunity 13:453. Marovich, M. A., M. A. McDowell, E. K. Thomas, T. B. Nutman. 2000. IL-12p70 production by Leishmania major-harboring human dendritic cells is a CD40/CD40 ligand-dependent process. J. Immunol. 164:5858. MacDonald, A. S., A. D. Straw, B. Bauman, E. J. Pearce. 2001. CD8− dendritic cell activation status plays an integral role in influencing Th2 response development. J. Immunol. 167:1982. Kamanaka, M., P. Yu, T. Yasui, K. Yoshida, T. Kawabe, T. Horii, T. Kishimoto, H. Kikutani. 1996. Protective role of CD40 in Leishmania major infection at two distinct phases of cell-mediated immunity. Immunity 4:275. Campbell, K. A., P. J. Ovendale, M. K. Kennedy, W. C. Fanslow, S. G. Reed, C. R. Maliszewski. 1996. CD40 ligand is required for protective cell-mediated immunity to Leishmania major. Immunity 4:283. Soong, L., J. C. Xu, I. S. Grewal, P. Kima, J. Sun, B. J. Longley, Jr, N. H. Ruddle, D. McMahon-Pratt, R. A. Flavell. 1996. Disruption of CD40-CD40 ligand interactions results in an enhanced susceptibility to Leishmania amazonensis infection. Immunity 4:263. Wiley, J. A., A. G. Harmsen. 1995. CD40 ligand is required for resolution of Pneumocystis carinii pneumonia in mice. J. Immunol. 155:3525. Kishimoto, K., V. M. Dong, S. Issazadeh, E. V. Fedoseyeva, A. M. Waaga, A. Yamada, M. Sho, G. Benichou, H. Auchincloss, Jr, M. J. Grusby, et al 2000. The role of CD154-CD40 versus CD28–B7 costimulatory pathways in regulating allogeneic Th1 and Th2 responses in vivo. J. Clin. Invest. 106:63. Nierkens, S., P. van Helden, M. Bol, R. Bleumink, P. van Kooten, S. Ramdien-Murli, L. Boon, R. Pieters. 2002. Selective requirement for CD40-CD154 in drug-induced type 1 versus type 2 responses to trinitrophenyl-ovalbumin. J. Immunol. 168:3747. MacDonald, A. S., A. D. Straw, N. M. Dalton, E. J. Pearce. 2002. Cutting edge: Th2 response induction by dendritic cells: a role for CD40. J. Immunol. 168:537. MacDonald, A. S., E. A. Patton, A. C. La Flamme, M. I. Araujo, C. R. Huxtable, B. Bauman, E. J. Pearce. 2002. Impaired Th2 development and increased mortality during Schistosoma mansoni infection in the absence of CD40/CD154 interaction. J. Immunol. 168:4643. Ijima, K., M. Murakami, H. Okamoto, M. Inobe, S. Chikuma, I. Saito, Y. Kanegae, Y. Kawaguchi, A. Kitabatake, T. Uede. 2001. Successful gene therapy via intraarticular injection of adenovirus vector containing CTLA4IgG in a murine model of type II collagen-induced arthritis. Hum. Gene Ther. 12:1063. Nomura, M., K. Yamashita, M. Murakami, M. Takehara, H. Echizenya, M. Sunahara, N. Kitagawa, M. Fujita, H. Furukawa, T. Uede, S. Todo. 2002. Induction of donor-specific tolerance by adenovirus-mediated CD40Ig gene therapy in rat liver transplantation. Transplantation 73:1403. Iio, J., K. Katamura, H. Takeda, K. Ohmura, T. Yasumi, T. A. Meguro, Y. Ohshima, T. Nakahata. 2002. Lipid A analogue, ONO-4007, inhibits IgE response and antigen-induced eosinophilic recruitment into airways in BALB/c mice. Int. Arch. Allergy Immunol. 127:217. Sornasse, T., V. Flamand, G. De Becker, H. Bazin, F. Tielemans, K. Thielemans, J. Urbain, O. Leo, M. Moser. 1992. Antigen-pulsed dendritic cells can efficiently induce an antibody response in vivo. J. Exp. Med. 175:15. Ruedl, C., M. F. Bachmann. 1999. CTL priming by CD8+ and CD8− dendritic cells in vivo. Eur. J. Immunol. 29:3762. Pooley, J. L., W. R. Heath, K. Shortman. 2001. Cutting edge: intravenous soluble antigen is presented to CD4 T cells by CD8− dendritic cells, but cross-presented to CD8 T cells by CD8+ dendritic cells. J. Immunol. 166:5327. Maldonado-Lopez, R., C. Maliszewski, J. Urbain, M. Moser. 2001. Cytokines regulate the capacity of CD8α+ and CD8α− dendritic cells to prime Th1/Th2 cells in vivo. J. Immunol. 167:4345. Smith, K. M., L. Pottage, E. R. Thomas, A. J. Leishman, T. N. Doig, D. Xu, F. Y. Liew, P. Garside. 2000. Th1 and Th2 CD4+ T cells provide help for B cell clonal expansion and antibody synthesis in a similar manner in vivo. J. Immunol. 165:3136. Faquim-Mauro, E. L., R. L. Coffman, I. A. Abrahamsohn, M. S. Macedo. 1999. Cutting edge: mouse IgG1 antibodies comprise two functionally distinct types that are differentially regulated by IL-4 and IL-12. J. Immunol. 163:3572. Peng, X., J. E. Remacle, A. Kasran, D. Huylebroeck, J. L. Ceuppens. 1998. IL-12 up-regulates CD40 ligand (CD154) expression on human T cells. J. Immunol. 160:1166. Lee, B. O., L. Haynes, S. M. Eaton, S. L. Swain, T. D. Randall. 2002. The biological outcome of CD40 signaling is dependent on the duration of CD40 ligand expression: reciprocal regulation by interleukin (IL)-4 and IL-12. J. Exp. Med. 196:693. Grewal, I. S., J. Xu, R. A. Flavell. 1995. Impairment of antigen-specific T-cell priming in mice lacking CD40 ligand. Nature 378:617. Grewal, I. S., H. G. Foellmer, K. D. Grewal, J. Xu, F. Hardardottir, J. L. Baron, C. A. Janeway, Jr, R. A. Flavell. 1996. Requirement for CD40 ligand in costimulation induction, T cell activation, and experimental allergic encephalomyelitis. Science 273:1864. Yang, Y., J. M. Wilson. 1996. CD40 ligand-dependent T cell activation: requirement of B7-CD28 signaling through CD40. Science 273:1862. Lutz, M. B., G. Schuler. 2002. Immature, semi-mature and fully mature dendritic cells: which signals induce tolerance or immunity?. Trends Immunol. 23:445. DeKruyff, R. H., R. S. Gieni, D. T. Umetsu. 1997. Antigen-driven but not lipopolysaccharide-driven IL-12 production in macrophages requires triggering of CD40. J. Immunol. 158:359. Schnare, M., G. M. Barton, A. C. Holt, K. Takeda, S. Akira, R. Medzhitov. 2001. Toll-like receptors control activation of adaptive immune responses. Nat. Immun. 2:947. Reis e Sousa, C.. 2001. Dendritic cells as sensors of infection. Immunity 14:495. Edwards, A. D., S. P. Manickasingham, R. Sporri, S. S. Diebold, O. Schulz, A. Sher, T. Kaisho, S. Akira, E. S. C. Reis. 2002. Microbial recognition via Toll-like receptor-dependent and -independent pathways determines the cytokine response of murine dendritic cell subsets to CD40 triggering. J. Immunol. 169:3652. Boonstra, A., C. Asselin-Paturel, M. Gilliet, C. Crain, G. Trinchieri, Y. J. Liu, A. O’Garra. 2003. Flexibility of mouse classical and plasmacytoid-derived dendritic cells in directing T helper type 1 and 2 cell development: dependency on antigen dose and differential Toll-like receptor ligation. J. Exp. Med. 197:101. Langenkamp, A., M. Messi, A. Lanzavecchia, F. Sallusto. 2000. Kinetics of dendritic cell activation: impact on priming of TH1, TH2 and nonpolarized T cells. Nat. Immun. 1:311.